The COROT satellite was developed by the French national space agency, CNES, which led an international effort involving Austria, Spain, Germany, Brazil and the European Space Agency. Produced by Alcatel Alenia Space, COROT is a pioneering satellite designed to study the vibratory performance of stars to determine their internal structure, age and composition. Data from the spacecraft could be used to seek out new planets, possibly confirming the existence of telluric celestial bodies with physical properties comparable to the Solar System's own rocky planets. According to French Space Agency, CNES, the spacecraft, belonging to the Proteus series, was equipped with a 27-centimeter diameter afocal telescope and a 4-CCD camera sensitive to tiny variations of the light intensity from stars. The COROT instrument makes it possible, with a method called stellar seismology, to probe the inner structure of the stars, as well as to detect many extrasolar planets, by observing the periodic micro-eclipses occurring when these bodies transit in front of their parent star. By its high photometric performances and its observing runs covering five months without interruption, the COROT experiment aims to be a pioneer mission in the discovery of telluric extrasolar planets, bodies with properties comparable to those of the rocky planets of the solar system. Its launch was scheduled for 2006 into a 896-kilometer circular polar orbit. The mission to launch COROT was announced on Jan. 4, 2005 and, at the time, it was expected to take place in the second quarter of 2006. 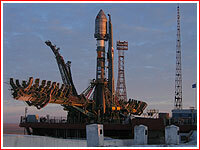 The launch was then pushed to September and October 2006. 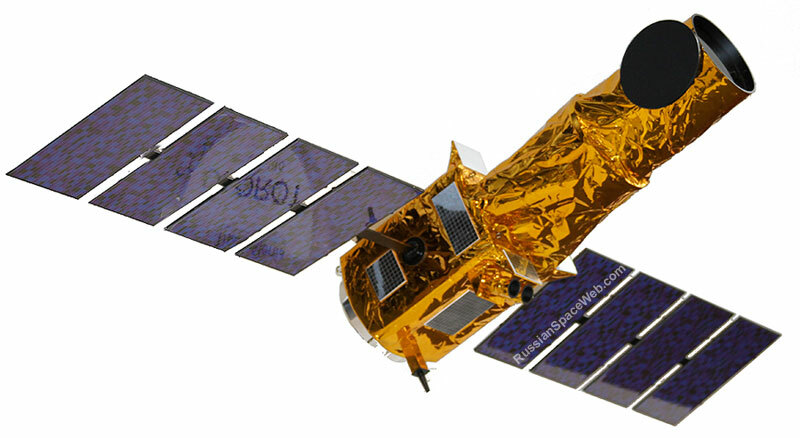 After problems with the launch of Metop satellite in July 2006, the Corot mission was pushed to December 21, 2006, and it could be preceeded by the launch of the Meteor-3M onboard the first Soyuz-2.1b, which itself was delayed from 2005 and the fourth quarter of 2006. 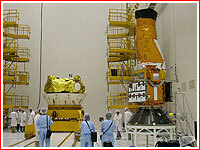 As of beginning of October 2006, the delivery of the Corot spacecraft to Baikonur was expected on Oct. 23, 2006. The mission was then postponed from Dec. 23, 2006 and finally scheduled for December 27, 2006, at 17:23:39 Moscow Decree Time. The upgraded Soyuz rocket flew a successful inaugural flight, delivering the COROT astronomy satellite for the French space agency, CNES. 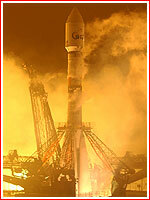 The Soyuz-2.1b rocket lifted off from Baikonur Cosmodrome's Site 31 on December 27, 2006, at 17:23 Moscow Time (14:23 UT). Following a 50-minute mission, the launch vehicle placed the 630-kilogram satellite into a circular polar orbit. It was the 1,717th flight of a Soyuz vehicle, according to Starsem company. Shortly after the launch, tracking radar found the Corot satellite in the planned 887 by 915.8-kilometer orbit with the inclination 90.03 degrees toward the Equator. The flight was carried out under the joint responsibility of Arianespace and its Starsem affiliate, which performs commercial operations with the Soyuz launcher. COROT was booked by Arianespace in January 2005. The Soyuz-2.1b vehicle incorporates a more powerful third stage engine, representing the latest step in a cooperative European/Russian program to upgrade the Soyuz family of rockets, which is expected to fly from Europe's Spaceport in Kourou, French Guiana. The first Soyuz 2-1b's mission builds on the successful introduction of the improved Soyuz-2.1a launcher, which has flown three times. The initial Soyuz-2.1a flight occurred in November 2004 from Russia's Plesetsk Cosmodrome, and was followed by Starsem's utilization of the vehicle to orbit the MetOp-A meteorological satellite last October from Baikonur Cosmodrome. Another Soyuz-2.1a mission was performed several days ago, when a Russian governmental payload was launched from Plesetsk Cosmodrome on December 24. The Soyuz-2.1a version implements a digital control system that gives increased mission flexibility and also provides additional flight control authority required when the new, enlarged Soyuz ST fairing is installed on the vehicle. These improvements are carried over to the Soyuz-2.1b, which is further enhanced with its increased-performance third stage engine. When the improved Soyuz enters service in Kourou, this launcher will become the reference medium-class vehicle for governmental and commercial missions - joining the proven heavy-lift Ariane 5 that already is in service, as well as the lightweight Vega, which currently is advancing through its development phase. A spent upper stage of the Soyuz-2.1b rocket, which successfully launched Europe's Corot satellite, provided a spectacular light show over the American state of Wyoming, as the vehicle plunged into the atmosphere on the morning of January 4, 2007. NORAD and U.S. Northern Command confirmed that it tracked the re-entry and that any surviving debris of the stage likely crashed in southwestern Colorado, and northwestern New Mexico. NORAD identified the "spacecraft" as "SL-4 rocket" - a designation accepted for the Soyuz family of rockets during the Cold War, when the USSR kept its own naming system secret. According to NORAD, no damage has been reported and the debris were not believed to be hazardous. The re-entry of pieces from this rocket was complete, NORAD said. "We encourage anyone who believes that they may know the location of a piece from this rocket exercise caution and inform their local authorities immediately for potential recovery operations," NORAD statement said. While the re-entry of space debris occurs almost daily, it is statistically unusual for the object to land in populated areas. The NORAD-USNORTHCOM Command Center informed the National Guard Bureau and Department of Homeland Security of this event so that local authorities and first responders would be aware, the announcement said. On Friday, January 5, 2007, a representative of the Russian space agency, Roskosmos, could not confirm or deny NORAD reports, but he said that the incident had been under investigation. 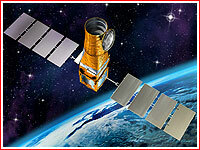 Only in 2012, posters in the Novosti Kosmonavtiki web forum reported that during the mission to deliver COROT satellite, the Fregat upper stage had experienced problems. As it transpired, a valve tasked to reduce pressurization of propellant tanks from 320 bars to 38 bars had leaked. As a result, the pressurization system worked below specifications during the mission, failing to provide needed pressure into the propellant tanks during the Fregat maneuvers. Fortunately, it was still enough to deliver propellant for all firings of the main engine and keep the vehicle on the right trajectory. A similar problem took place onboard Fregat during the launch of the Globalstar satellites on May 30, 2007. The investigation later concluded that specific design of the valve and the loss of flexibility in its membrane had been likely culprits. One source claimed that KBKhM design bureau, which built the Fregat's propulsion system possible used a new materials, later reverted back to previous design, thus solving the problem.